Lorna Bevan – There is a huge influx-an evolutionary Wave- of karmic interweaving of 5D deep space energy this week and beyond – just look at the aspects to the Galactic Centre and the Great Attractor above. The week begins with the Sun conjunct Eris at odds with Pluto -this is the first of 5 Eris/Pluto Squares between now and 2021. Much more about this to come in my Facebook posts this week. It occurs once every 500 years and will intensify the birth pangs of the new zeitgeist between now and 2030- increasing division, separation and chaos -think the Tower of Babel -in order to eventually seed greater integration between groups and religions. 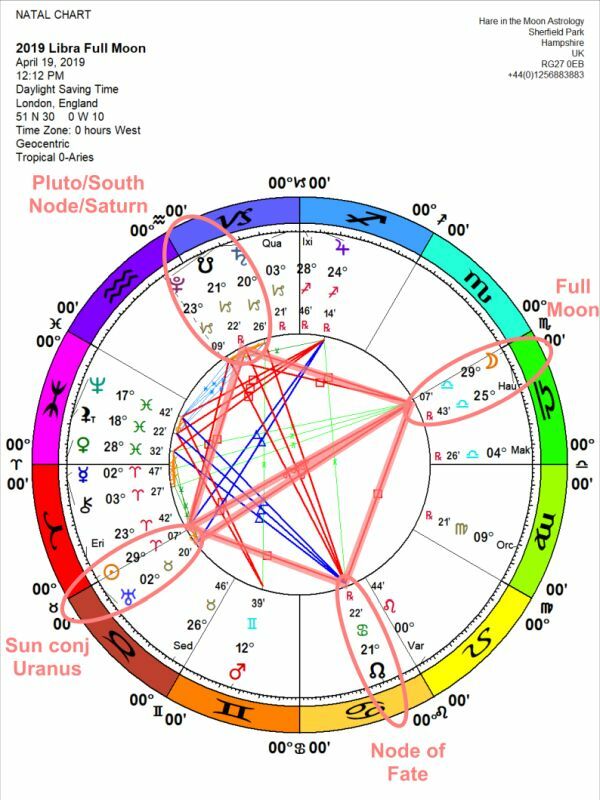 Friday’s 2nd Libra Full Moon across the master degrees of 29 Libra/Aries forms a Grand Cardinal Cross to Pluto/South Node of Fate/Saturn and the Node of Fate. The Sun is conjunct volatile Uranus and the Moon conjunct Haumea-the archetype of epochal events. Expect a huge power surge – at both its lowest and highest levels of expression- collectively and personally but be careful not to let it blow your energy grid wide open. “Invoking the power of the soul’s journey through all of the worlds. Poised at the brink of every conceivable possibility. But lingering over the darkness–that which is not yet complete, that which still must be encompassed. Being the veteran path finder who discovers yet again how much more there is than anybody has yet to admit. And being the astute observer who delights in the baffling complexity, the unresolvable open-ended nature of it all. Committed to coming up with hidden elements and making sure that they find their place, but not dwelt upon, because here comes the next and then the next. The journey itself is the point and each juncture is the destination”. As an Aries, once again, you are right in the cross hairs of some potent astrology. The Sun now at the master degree of your sign is at odds with reality planets Saturn and Pluto and merged with disruptor Eris. On Friday, there is a second Full Moon right across your axis of relationships, self and other. Between the 15-20th, expect emotional highs and lows as permanent endings and beginnings – a long time in the making – change your personal landscape. If you can, frame it as a long overdue spring clean of outgrown partnerships or alliances. How you see yourself versus how others see you is the issue now. Ask yourself:” Are my relationships keeping pace with who I am today?” and look at your habitual dynamics-are you overly co-dependent or overly independent? Time to rebalance. Take heart! After three weeks of low energy with depleted solar batteries, finally the Sun returns to your own sign to mark the start of your personal New Year. And expect it to kick off in style as Friday’s doozy of a Full Moon activates planet of fireworks, Uranus also in Taurus. This is when you’ll start to experience what hosting the Awakener in your sign for the next 7 years really means. It’s a wake up call that comes whether you like it or not through your old life being turned upside down and inside out by circumstances beyond your control. Instead of hiding your head in the sand, collaborate by deliberately throwing a spanner into your most stuck habits and routines; by attracting new people, new ideas and new encounters into your life. Luck is created when you’re willing to take risks, follow your hunches and take every opportunity to expand your world. Restlessness is a good sign. Friday’s doozy of a Full Moon activates your zone of alliances, friendships and priorities. It is bringing permanent endings which contain the seeds of new beginnings, even if they are not yet visible to you. Expect a changing of the guard in your people landscape as old friendships disappear-some will wither, others will happen because of a sudden change in circumstances. Instead of thinking of it as a loss, realize that it is a necessary part of your evolution over the next two years, where the vector is in the direction of far greater freedom, autonomy and independence. Focus on leaving behind anyone who drains your energy and spending more time with those who light your spirit. Just like Aries, you are right in the cross hairs of some very potent astrology. All four angles of your chart-your psychological and emotional foundations-are being activated/woken up by Friday’s doozy of a Full Moon -the 2nd in Libra in a month. So there’s a message here – if you didn’t make adjustments a month ago, they are likely to arrive from the outside. Under pressure are your relationships, your career, how and where you live and your sense of identity-all tightly interwoven. Take a fresh look at the most personal aspects of your life-how you parent yourself and how you align your purpose with what you do in the world. Have you had an overly rosy romantic view of what home and family means? How do you become more realistic without losing your need for connection? Seeing what is, not what you’d like it be. On Sunday 21st, the Sun makes his annual crossing of your Midheaven-the very pinnacle of your chart-beginning a new cycle of life direction, purpose and career. Just days earlier-on Friday 19th-a doozy of a Full Moon zaps your angle of new horizons and expansion. So, instead of sitting back and hoping for something to happen, make it an absolute priority to upgrade your knowledge base by enrolling in further study or by traveling to meet new people and opening your mind to much bigger possibilities. The greater your interpersonal skills of rapport building and cooperation, the more options you will have. Be at cause, not at effect and if you’ve been realising for some time that your ladder is up against the wrong wall, now is the time to do something about it. This potent astrology is all about permanent endings and clearing away what you’ve outgrown and outlived. The clear message from Friday’s rare second Full Moon across Libra and Aries is that you need the Will and desire to make radical permanent changes instead of just tinkering around the edges. The huge power surge can either blow your energy system apart or you can collaborate with it by making long overdue changes, particularly to your income, assets and resources. Your money is important. How are you managing yours? Are you in debt to another? Are you underestimating, undervaluing your skills? If the prospect of confidence and believing in yourself enough to make a financial move stirs up fear for you, investigate why. It may ask you to take a leap of faith. Key words for you now: your income, talents / gifts /skills/resources you have that can support you, movable possessions, where you derive your security, your ability to survive and feel safe in the world. As you can probably tell, once again, you are right in the cross hairs of some extremely potent astrology. The universe has sent you two Full Moons this year instead of the usual one, and the one on Friday April 19th is a doozy. It falls right on the master degree of Libra in a huge Grand Cross with Sun/Uranus/Saturn/Pluto and the Nodes of Fate, turning an old life dark with permanent endings that are probably long overdue. Frame it as a sort of cosmic spring clean or de-cluttering and, like Marie Kondo, leave the outgrown, the toxic and the dross in your dustbin of history and keep only what sparks joy. Apply this approach to people as well as to your habits, your career and your home. Watch as surprising events this week support you in knowing what should go and what should stay. Shaking off the dust of the past. If you’ve been longing for some excitement, here it comes! A doozy of a Full Moon in the engine room of your chart on Friday followed by the Sun meeting volatile Uranus in your opposite sign on Sunday will light the blue touch paper under relationships of all kinds. Knowing this, see it as a huge opportunity to claim more freedom, more power and more autonomy. Watch for clues this next weekend to how the Awakener and disruptor traveling through your opposite sign for the next 7 years might play out. Your natural tendency is to stay on the side lines, watching and waiting before making a move but these cosmic wild cards are offering you a huge power surge to extricate yourself from contracts, partnerships and arrangements you’ve long outgrown. If you’ve been restless with the status quo, chafing at the bit to do something different or feeling totally trapped in an immovable situation, here comes the planetary dynamite to blast you free and clear. A potent Full Moon on Friday brings endings and new beginnings in anything connected to your creativity, work or life direction. Expect intriguing new projects and opportunities to start coming your way but first you need to tie up loose ends, complete what’s unfinished and give yourself some space to re-orient yourself. As a Jupiter ruled Sagittarian, to breathe you need to see wide horizons in front of you, to be on a quest for meaning and adventure. So say a big Yes to opportunities that will turn an old outgrown life dark, even if it means a changing of the guard in some relationships. Just like the other cardinal signs, you are right in the crosshairs of this week’s potent astrology. A very rare second Full Moon across your angle of life direction on Friday 19th is giving you another chance to complete an important career move or project. At the weekend, the Sun encounters wild card Uranus suggesting that life at home could be about to get interesting. As the Full Moon brings a huge power surge in your own sign, be careful not to either burn yourself out or alienate those close to you by being hyperactive and demanding. Build bridges, mend fences and get everyone who matters on board when you start overthrowing traditions. Your personal ruler -volatile Uranus- is in the frame this week, so expect a big surge of adrenaline around Friday’s Full Moon. The question is what to do with it? This is a rare second Full Moon in your angle of far horizons, travel, study and expanding your world view. So, if you haven’t yet made plans for a trip to somewhere totally unfamiliar or to start an intriguing new passion, do it now. At the weekend, the Sun crosses into your zone of home, family, tribe and belonging, meeting disruptor Uranus on Sunday. Not only do you need to take a leap of faith by leaving old outgrown habits and routines by the wayside but you also need to take those who matter along with you. Channel the power surge into brainstorming exciting ways to shake up your comfort zone. Luck is created when you’re willing to take risks, follow your hunches and take every opportunity to expand your world. There is so much activity in the dynamic, pioneering, take no prisoners cardinal signs this week, that you may feel like the proverbial fish out of water. Knowing this in advance, do what needs doing, tie up loose ends ahead of Friday’s doozy of a Full Moon then leave the posturing, arguing and assertiveness to others. On Sunday 21st, the Sun returns to earthy Taurus- a sign compatible with yours- and you will start to feel better. If someone springs an unwelcome surprise on you by completely changing their mind or de-railing important plans, avoid head to head confrontation but deal with it quickly and firmly. During the Easter break, take time out to identify your next steps resting in the comfort of your own wisdom.